If you live in the Kanto area, the three branches of Devilcraft – the first in Kanda and the second in Hamamatsucho with the third in Gotanda having opened in June – should be on your go-to list for craft beer and pizza. Even for those outside of Kanto, a visit to Tokyo often ends up going to Devilcraft. It’s safe to say that in the four years that they’ve been operating, Jason Koehler, John Chambers, and Mike Grant have made a big splash on the craft beer scene. And, with the opening of their brewery in 2015, they don’t seem to be slowing down. Jason, John, and Mike all have background in home brewing back in the US, where the hobby has proved to be highly influential and also created a burgeoning craft beer scene. Mike was in college when he was introduced to craft beer and home brewing by his brother. It’s a familiar story – beer cost too much, and making it yourself is cheaper. Later, the hobby became an obsession, quickly surpassing his brother’s interest. He volunteered at several breweries in Kawasaki in his free time, and dreamed about someday opening his own brewery. Jason first thought about home brewing around 1997 or 1998. A long time beer lover, he had made wine with his father, and his grandfather homebrewed during the prohibition era. After some procrastination, he began to brew in earnest around 2003. From the beginning, he wanted to become a professional. In 2006, he attended the Siebel Institute in Chicago to study professional beer making, landing a job with the now defunct Aizu Beer from Fukushima after moving to Japan the same year. John thought about home brewing on and off for a while, but wasn’t in such a hurry due to how easy it is to simply buy any type of beer you want (no such luck for those of us living in Japan). Unlike Japan, the range of beers available in the US is immense. John had some experiences with home brewing and craft beers during the two years he was working at General Electric, and when he came to Japan he found that there were no beers that he liked. After working for GE for 2 years he went back to the USA and experimented with it. Later when he returned to Japan and was unable to find a beer he liked. On his next trip home, he bought his own homebrew equipment. Eventually plans came full circle and the three of them (plus Ryo Suzuki) are brewing beers like a group possessed. They have already brewed and released over forty batches of beer, including collaborative brews. Indeed, on the day BeerTengoku went along to their brewery (located in an industrial estate ten minutes from Oimachi station), Tsutsui-san and Fujiura-san, owners of Watering Hole in Yoyogi, were there working on such a beer. Seeing the group of brewers looking over their creation, and the smells from the mash emanating around the room, made it look so easy. However, it has been a long road to get to this stage. The original idea was a production brewery – no thought about a restaurant came to mind. The problem was finding a space. Prices were at a premium and everything they wanted was either too far from the city or too expensive. When they were looking at their business plan and started hearing stories about the brewing license, they realised it would be a lot easier and smarter to start a pub. The idea was to find a pub that had space for a little brewery and get some money going, then eventually get some of their own beers on. They switched their plans and started looking for a bigger spot that could host a pub and was near a station. The first suitable space, in Kanda, was the closest to the station that they could find. It also had multiple floors. This way they could set up a small brew system on one of the upper floors away from the business, enabling them to make their own beer on the premises. Licensing is easier if you can show that you can sell beer yourself – though as Devilcraft were able to show they could clearly sell the beer due to the restaurant sales, there was no need for them to do this. However, they have paid it forward by helping other breweries get their licenses, such as Kyoto Brewing and Ushitora. The search for a larger shop came up and with it the renewed hope for finding a place that could hold a brewery and also a restaurant too. With the Hamamatsucho branch, the floor space was bigger, located in Tokyo, and near a station. Three perfect qualities when looking for a store and customers. And again the store proved to be a big hit with customers, who at the time of writing were 60% Japanese and 40% foreigners, meant that the plans for the brewery were put on the back burner until somewhere came up. With business booming, it wouldn’t have made financial sense to install a brewery. It was in Shinagawa, at an old stamping shop located in an industrial estate that they found their place. Close to the station and also the three branches of Devilcraft allows them to deliver beer quickly and as fresh as can be. With a building found and leased, along with the plans for the brewery in motion, it was only a matter of time that the guys got brewing. But even then, there was still a hiccup in the plans for them. The majority of breweries in Japan have their equipment shipped in from overseas, from places such as Germany or the USA, and have to get it all set up before the tax office signs off on the place. Of course, with Japan and customs comes bureaucracy galore and paper checks and Devilcraft had a fair amount of bureaucracy to deal with. The license itself wasn’t that big of an issue compared to getting the equipment over. John and Mike both lamented about how the people employed to import the equipment were a tad too precise in their customs forms which caused a hold up in the setup of the brewery. Anything that is involved with food or food manufacturing then it must go through quarantine though often people expedited the service by being generous with the truth by using just enough detail so everyone is happy but not enough so people do not get into trouble. To compound matters, the original customs officer assigned to clearing the import had little experience in this area, increasing the delay until his boss stepped in to take over. By that time, a low of time had been lost to the delay. Moreover, plastic that comes into contact with the beer has to be tested. However, Japan having its own food and hygiene standards, anything imported in immediately fails to qualify for them and thus must be tested before being passed through customs. Eventually, after much wrangling and rewording of customs forms, the equipment got through and contractors came in to install the piping and electrical work. All three of them bring something different to the brewing process – John with his background in nuclear engineering is very much hands on with the machinery and equipment in the brewery. Mike as an extensive interest in water quality and also yeast – so much so that on the day of the interview he had to go check yeast counts and to ensure that they strain they were using – WLP001 for those interested – was healthy. Jason has a wide knowledge and understanding of different styles and ingredients. Moreover, when asked about the packaging process such as kegging and transferring, he was the first to say he enjoyed that process while the others remained quiet about it. However, all of the roles around the brewery are shared and on the day, all three of them perused over the mash tun and the sight glass to ensure the beer quality and colour was up to their high standard. When it comes to deciding the recipes, all three were equal in saying that the decision process is collective. On occasions, one of them may bring an idea to the table which is then discussed among them though it takes all of them to agree before any brewing starts. While this may sound like a cumbersome process, at the time of writing, Devilcraft had already brewed their way through approximately twenty different batches of beer, though some of these have been evolutions, such as the Devil in John’s Brown moving to its second iteration, while others have been new batches, for example, their Imperial Stout. With them all having a background in American craft beer, there have been inspirations too for ideas from that area too, for example, Speakeasy’s Prohibition Ale, an amber ale style beer. Some breweries, such as Stone Brewing, also put their recipes online, so it is possible to get some ideas there as well. There have also been occasions where they have used brewing software, such as BeerSmith, and “played around with it” using their knowledge of ingredients until they have come up with a beer that has the desired colour and target IBU. Since opening, Devilcraft have produced a wide and varied amount of beers. Recently, they have begun to rebrew some of the earlier batches using adjusted techniques, such as an overhaul of their dry hopping technique. This included much later kettle additions and additions in the secondary fermentation stage, used to impart aroma and flavor, rather than bittering. While the recipes at Devilcraft are worked on as a team, they are also well versed in using other techniques from the homebrew scene and other professional breweries. One recipient of this was their Orange Vanilla Porter and how much orange peel to use. In the end, 8 orange peels was enough to impart the flavor they wanted in 300L. It also had the added benefit of providing the brewers with some vitamin C as they got to eat the oranges too. Who thought making beer wasn’t healthy? Devilcraft faced many of the same issues with getting to grips with the new equipment and ingredients. Initial problems with the brewings included “super genki” yeast that meant abvs were higher than expected. Not so bad if you’re looking to get drunk, but too much alcohol changes the flavours of beers that don’t have heavy hop flavours or bitterness. The temperature gauge on the mash tun was giving off readings too, so another one has been installed to help them control the mashing process. All three of them agree that it’s still a learning process for what kind of beer they can make – they know the ingredients very well and they know what to expect with the addition of hops. The challenging parts have been what is their mash resume is going to be and the amount of dry hopping. With so much emphasis on the present, it was on natural that the conversation moved towards the future of Devilcraft, both in terms of restaurants and also the brewery. The restaurants operate at almost 100% capacity every night, so it’s only natural to think about another one opening soon. While Yokohama does have a good variety of craft beer bars, one thing it does lack is decent pizza and Jason mentioned that Yokohama probably needs a great pizza restaurant (it does!). The main focus though is the brewery for all three of them and helping it to grow so it can support four or five bars. 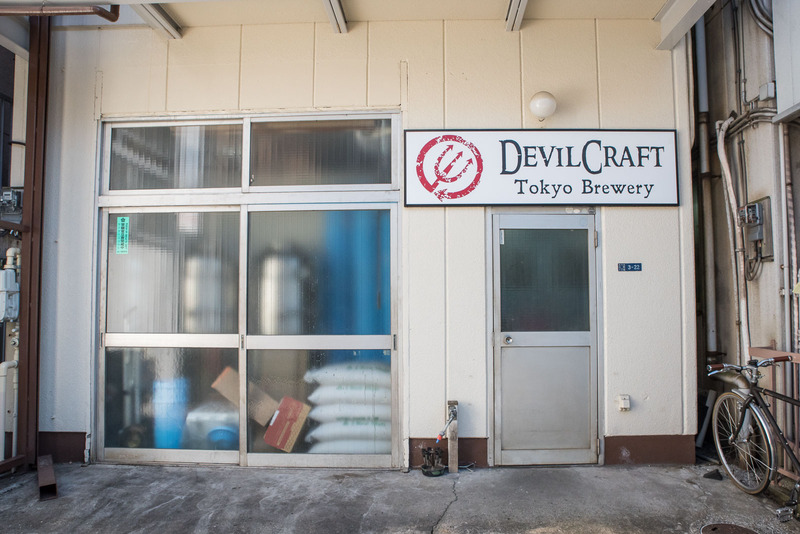 In June, Devilcraft opened in Gotanda, their first location on the west side of Tokyo. With the brewery, it also allows brewers to come to them for collaborative projects, rather than the other way around, and on the day Tsutsui-san from Watering Hole (another great bar in Tokyo and also trying to open their own brewery) was brewing a pale ale. One of the sticking points to doing an international collaboration is the shipping of beers, both to and from Japan, and there isn’t much of a demand outside of Japan for Japanese craft beer, unlike the demand for American craft beer. However, the Victory x AQ Bevolution x Devilcraft collaboration came out this year and proved to be an interesting take on the pilsner with it being a red pilsner rather than your usual golden-yellow coloured. I tried some at the Oedo Beer Festival in April, and enjoyed it very much. With the opening of the brewery, Jason, John, and Mike have finally returned to their original plans, while also helping improve the craft beer market in Japan. The demand for craft beer is increasing month upon month, but where Devilcraft stands out is the knowledge and understanding of craft beer. The passion that all three of them have shines through in the beer that they produce and the past year has been wildly successful for them. So next time you’re out and see some Devilcraft beer, get a pint – with the speed and variation that they produce beer, it could be your one and only chance for you to try something special. Thanks, much appreciated. This is only a fraction of what we got though from the DC guys. So much going on there and great to see them awards and notoriety for their beers as well.